I opened my new journal for 2014 (from Dayspring) and on the very first page it says: fill me. And, here is my first journal entry of this brand new year. Fill me! What a wonderful way to begin a new year. Fill me, Lord… but, fill me with what exactly? Everything You are, everything You have, are already mine. Your Word makes that very clear. All Your riches are mine. Your mind is in me. I have a new heart because of You. I am no longer blind because You restored my sight and I can see clearly now! I need the want-to, the will-to, the desire-to… honor You in all I do. Because when I will lay myself down and allow my words, my actions, my thoughts to honor You, then and only then, will I be filled. 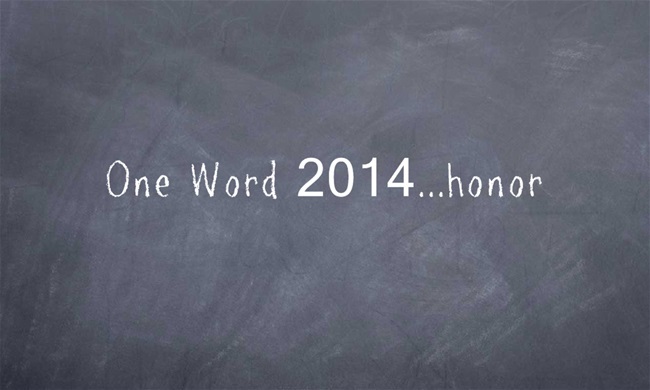 My one word 2014 – HONOR. Thank you for this, Susan. My word would be “tenacity”………in prayer, in Bible reading, in improving in areas of my life that have such great need. I loved this. Fill me with the desire to honor,serve, obey, praise and so much more. Great New Year’s prayer. Yes, your visit to Being Woven as I declared my one word for 2014 brought me here. Your words are as if I said them too. As the OneWord365 site has, we share the same word and are in the “honor” tribe! May we bless the Lord with our obedience and willingness and hearts as we honor Him in all we say, do, and are. Linda, so glad you “drove” over and paid a visit! Now, for the accountability of living our one word. I’m pretty hard on myself and have a fair amount of self-discipline but any help is always welcome! Blessings! Trust…No matter what my eyes see or my ears hear…trust in every situation. Jean, how nice of you to visit! Enfold…be interesting to follow that! yes fill me with more You and less of me! My word is Believe, I want to believe all the promises of God are true for me and so much more. Alecia, yes, all the promises of God are yes & amen! AMEN! Believe & Receive! Encourages me to have new “drive-by’s”!!! “Connect” …. this blog post is beautiful. I love your word and the prayer to God that captures such a strong desire to have Him hear you and walk with you. Love it. Very nice to meet you! Lovely to meet YOU too Claudia. Thanks for dropping by! Fear Not! I do have to stop and ponder about how we are already full – interesting thought. Grace, I want to live in His Grace!